Oldest commercial building on Jeff Davis Avenue. Built in 1924 by Hancock County Bank as its second branch. Located in Long Beach primarily to serve this area's growing truck farming industry. 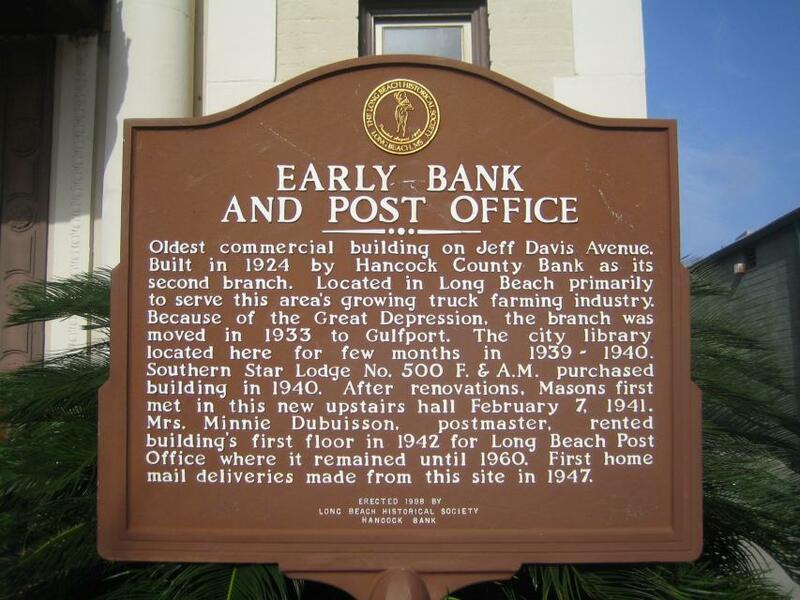 Because of the Great Depression, the branch was moved in 1933 to Gulfport. The city library located here for few months in 1939-1940. Southern Star Lodge No. 55 F. & A. M. purchased building in 1940. After renovations, Masons first met in this new upstairs hall February 7, 1941. Mrs Minnie Dubuisson, postmaster, rented building's first floor in 1942 for Long Beach Post Office where it remained until 1960. First home mail deliveries made from this site in 1947. This marker can also be identified by its HM code. You can use the hashtag #HM1JAX in tweets, and any other place where you might refer to this marker, including when searching on this site.